Need a Spring jacket? The Patched Utility Jacket (now $80 + 40% off) is a fantastic unique option. 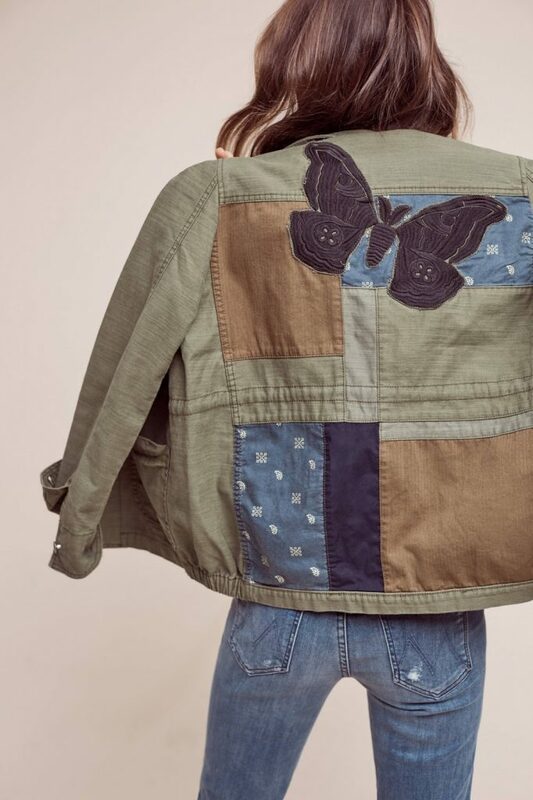 Today is the final day of Anthropologie’s extra 40% off sale promotion and pretties like the Patched Utility Jacket (now $80 + 40% off) are somehow still available! In multiple sizes! Free People has also made its sale an extra 40% off for today only. Will yourself green like Spring courtesy of the Vista Bomber (now $90 + 40% off). 1 | The Vista Bomber (now $90 + 40% off) looks great with skirts as you can see above, or jeans too. I like to wear mine with a white v-neck tee. 2 | I’m so surprised that the sand is the final color of the Itinerary Bomber (now $90 + 40% off) left, as it’s the color I own and love the most! It can play grey or brown depending on what you match it with, and looks ultra-cute on. Don’t believe me? Check it out here and here, and on me next week. Runs TTS. 3 | The Fringed Chambray Buttondown Tunic (now $100 + 40% off) is a casual favorite of mine, and also comes in a cute split-back top version. 4 | Green is a color you can expect to see everywhere this spring, so the Kinsley Dress (now $60 + 40% off) should transition well. Go up two sizes in this one. 5 | The Striped Cashmere Top (now $150 + 40% off) is lightweight yet warm cashmere perfection. 6 | I adore the look of the Pleated Velvet Midi Skirt (now $80 + 40% off) and can’t wait for mine to arrive! 7 | I will likely wear the skirt with the Colorgrade Drops (now $30 + 40% off). 8 | The red version of the Laced High-Neck Blouse (now $90 + 40% off) is still available and sure to look great from late Winter well into Spring. 9 | What a beautiful dress the Claudette Dress (now $150 + 40% off) is!! 10 | If you’re looking for a lightweight trench, you’ve landed it with the Edmond Trench (now $120 + 40% off). The Star Studded Pullover (now $100 + 40% off) looks cute from afar, and awesome up close. 1 | The Star Studded Pullover (now $100 + 40% off) above is so fun to look at, and comfy to wear! 2 | I love the grey tones and laid back vibe of the We The Free It’s Time Thermal (now $50 + 40% off). You can safely size down in this one. 3 | A little shiny, a little more showy, the Shimmers and Stripes Buttondown (now $70 + 40% off) makes a great work blouse! 4 | A fun, playful waffle texture thermal and scout-esque embellishments make the Bridget Tee (now $70 + 40% off) a great layering piece. 5 | The Those Little Doves Tunic (now $100 + 40% off) makes you look long, lean and has cute details all up and down. Runs TTS. 6 | The Ritu Tee (now $70 + 40% off) is a cutely embellished baseball tee with a gorgeous back neckline. 7 | I love the thick block heel and dusty color of the Flash Dance Heel (now $100 + 40% off). 8 | Wear a size 6 shoe? Then lucky you, because the ultra cute Cyndi Block Heel (now $70 + 40% off) is in-stock online in your size!! 9 | The Embellished Military Shirt Jacket (select colors now $100 + 40% off) is on sale in my favorite color, faded black! OOTD upcoming. 10 | And I know I’m totally insane on this one, but I love this Hooded Sequin Jacket (now $170 + 40% off). What items will you pick up on the last evening of these promotions? You can see all the Presidents’ Weekend promos here, and check out this morning’s post on Boden’s new promo too! Previous Post Boden ups its promo discount to 20% off!! Next Post Items I’m dreaming about these days….